that helps promote longer lasting color. Natural calming extracts including Oatmeal help comfort and soothe dry skin while Mango Seed Butter helps hydrate and smooth for a more radiant looking glow. • Dark DHA Free Bronzing blend with Henna, Black Walnut Shell and Caramel Extracts combined with natural tan enhancers helps provide a dark bronze glow. 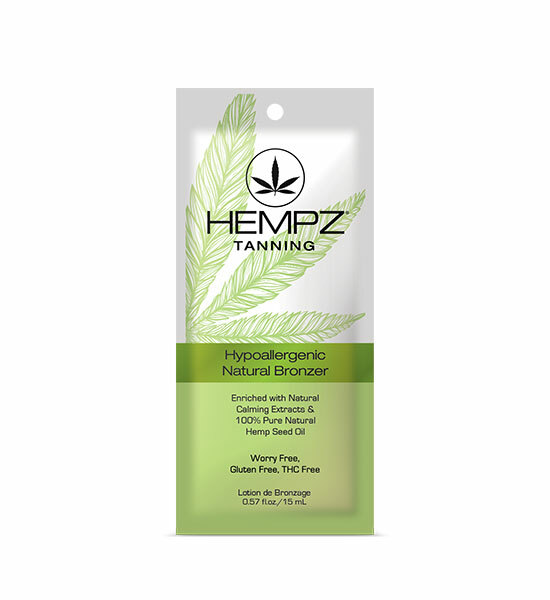 • 100% Pure Natural Hemp Seed Oil helps to hydrate, nourish and condition skin leaving it feeling exceptionally soft, smooth and moist. • Natural calming extracts including Oatmeal, help to comfort and soothe. • Blended with rich Mango Seed Butter that helps to hydrate and smooth gentle skin. Buy 2, Get 5 Packets Free!